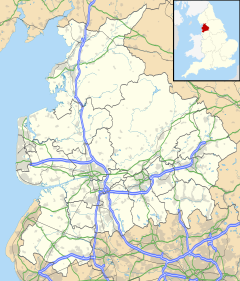 Bolton-le-Sands is a large village and civil parish of the City of Lancaster in Lancashire, England. The parish had a population of 4,098 recorded in the 2001 census, increasing to 4,127 at the 2011 Census. Referred to as Bodeltone in the Domesday book, the village was known as Bolton until the arrival of the railways, when the name was changed to Bolton-le-Sands to differentiate from similarly named towns on the same line, such as Bolton which was then a part of Lancashire and called Bolton-le-Moors. The oldest church in the village, founded prior to 1094, is the Church of England Holy Trinity church, originally dedicated to St Michael. The oldest part of the current building is the tower, supposed to have been built around 1500. The nave and chancel date from the 19th century. The other churches are the Roman Catholic St Mary of the Angels and the Christ Church United Reformed Church. The Lancaster Canal, built in the 1790s, is a major feature of the village. Also passing through the village is the A6 and the West Coast Main Line, although the railway station closed in 1969. The Village includes three pubs: The Royal Hotel, situated on the A6, The Packet Boat(closed in 2015), and the Blue Anchor are both within the centre of the village, along the main street. Bolton-le-Sands also have a football team, they play at Main Road, behind the aforementioned Packet Boat pub. Until 1969, Bolton-le-Sands had a railway station on the West Coast Main Line. The village has one school, Bolton-le-Sands Church of England Primary School, with around 300 pupils from the ages of 4 to 11 in a modern school building. The school is a successor to the old Boys' Free Grammar School, which dates from 1657, with the 19th century school building still used for community education. The school building was also home to the Bolton-le-Sands library until 1973, when the library was moved into a newly built site in the village centre. The library was controversially closed in Autumn 2016 following a renovation in 2015 costing a reported £283,000. An electoral ward with the same name exists. This ward stretches beyond the confines of the parish with a total population taken at the 2011 census of 4,255. Wikimedia Commons has media related to Bolton-le-Sands. ^ "Parish headcount" (PDF). Lancashire County Council. Archived from the original (PDF) on 10 December 2006. Retrieved 2009-01-10. ^ "Parish population 2011". Retrieved 7 June 2015. 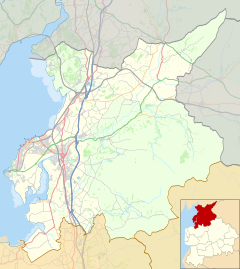 ^ "History of Bolton-le-Sands". Lancashire County Council. Archived from the original on 13 June 2011. Retrieved 1 April 2008. ^ "Ward population 2011". Retrieved 7 June 2015. This page was last edited on 24 January 2019, at 21:03 (UTC).